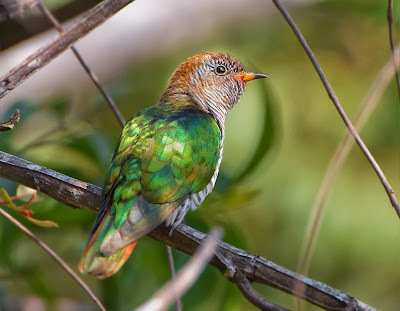 Asian emerald cuckoo Chrysococcyx maculatus, photographed by J. J. Harrison. The Cuculinae are the Old World parasitic cuckoos. These insectivorous birds are best known for their trait of laying their eggs in the nests of passerine birds, which then raise the cuckoo chicks as if they were their own. Within the Cuculinae, the bronze cuckoos of the genus Chrysococcyx are distinctive for the metallic green coloration on their upper parts. Characters (from Mason 1997): Small to large slender birds small to stout decurved bills with swollen rounded nostrils and vestigial rictal bristles; body feathering soft, sleek, and sometimes glossed brilliantly green or blue-black, close in varied tracts but without apterium between dorsal-cervical and interscapular tracts; no downs; aftershafts absent (vestigial? ); uropygial gland well developed, naked. Feet relatively weak, adapted for arboreal perching, zygodactylous with outer toe permanently reversed; tarsi rather coarsely scutellate, toes with short claws; hypotarsus with two closed canals. Sexes dimorphic or similar, males usually larger than females. Wings rounded to commonly pointed: ten primaries plus remicle and nine to twelve eutaxic secondaries moulting erratically in 'transilient' mode; alula four-feathered. Tail short to long and graduated: ten rectrices. Nares holorhinal and impervious, nasal septum imperforate; desmognathous palate with vestigial, incomplete vomer, palatines with narrowly rounded shelf, maxillary processes swollen and straight, lachrymals moderately enlarged to vestigial, sometimes almost reaching jugal bar, free from thin, variably enlarged ectethmoids, uncinate bone consistently present; basipterygoid processes vestigial; interorbital septum with two or three principal perforations; atlas notched or perforated; 14 cervical vertebrae (13 in Clamator); sternum double-notched to almost entire on either side, both spina interna and externa present (fused in Clamator) or only spina externa (Eudynamys, Scythrops), furcula with or without prolong hypocleideum; fossae flanking preacetabular processes of pelvic girdle narrow to wide, shelf of preacetabular processes square to rounded, not overlapping ischium dorsally, lateral perforations along either side of iliac crest obsolete to pronounced. Musculus expansor secundariorum 'cuculine'; pelvic muscle formula ABXY to AXY (ABEXY in Clamator), M. ambiens present; deep plantar tendons Type I. Carotid arteries paired. Syrinx tracheo-bronchial. Tongue small, cartilaginous; no crop; caeca present, rather long. Diploid karyotype of 78-80 chromosomes, with six pairs of macrochromosomes. [B94] Bock, W. J. 1994. History and nomenclature of avian family-group names. Bulletin of the American Museum of Natural History 222: 1-281. [D66] Dohrn, H. 1866. Synopsis of the birds of Ilha do Principe, with some remarks on their habits and descriptions of new species. Proceedings of the Zoological Society of London 1866: 324-332. [FST81] Falla, R. A., R. B. Sibson & E. G. Turbott. 1981. Collins Guide to the Birds of New Zealand and Outlying Islands 2nd ed. with addenda. Collins: Auckland. [JT12] Jetz, W., G. H. Thomas, J. B. Joy, K. Hartmann & A. Ø. Mooers. 2012. The global diversity of birds in space and time. Nature 491: 444-448. [J06] Johnstone, R. E. 2006. The birds of Gag Island, Western Papuan islands, Indonesia. Records of the Western Australian Museum 23 (2): 115-132. Mason, I. J. 1997. Cuculidae. In: Zoological Catalogue of Australia vol. 37.2. Aves (Columbidae to Coraciidae) pp. 219-254. CSIRO Publishers. [M03] Morcombe, M. 2003. Field Guide to Australian Birds, 2nd ed. Steve Parish Publishing. [RN72] Rutgers, A., & K. A. Norris (eds.) 1972. Encyclopaedia of Aviculture vol. 2. Blandford Press: London. [S89] Salvadori, T. 1889. Viaggio di Leonardo Fea nella Birmania e nelle regioni vicine. XIX. – Uccelli raccolti nei Monti Carin a nord-est di Tounghoo, nel Pegù presso Rangoon e Tounghoo e nel Tenasserim presso Malewoon. Annali del Museo Civico di Storia Naturale di Genova, Serie 2a 7: 369-438. [S13] Sarasin, F. 1913. Die Vögel Neu-Caledoniens und der Loyalty-Inseln. In Nova Caledonia: Forschungen in Neu-Caledonian und auf den Loyalty-Inseln. A. Zoologie vol. 1, Heft I (F. Sarasin & J. Roux, eds) pp. 1-78, pl. 1-3. C. W. Kreidels Verlag: Wiesbaden. [WS48] Whittell, H. M. & D. L. Serventy. 1948. A systematic list of the birds of Western Australia. Public Library, Museum and Art Gallery of Western Australia, Special Publication 1: 1-126.